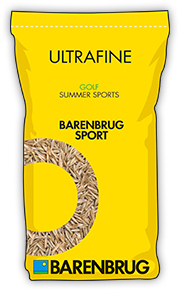 ULTRAFINE is a blend of perennial ryegrasses for use in areas of fine turf that demand tolerance to close-mowing and high wear with exceptional fineness of leaf. Golf green surrounds, walk-offs and tennis courts are perfect examples of where this grass seed mix comes into its own. Barolympic is the stand-out cultivar ryegrass for summer sports use. It is ranked #1 with a score of 8.6 in Table G4 of BSPB TGS 2019, the highest Mean score in the entire publication, and more than a full point clear of its nearest rival in G4! In addition to its outstanding Mean scores, Barolympic is ranked #1 for pale colour and #2 for fineness of leaf in Tables L1 and G4. This makes it exceptionally easy to blend in with other grass species, such as red fescue or annual meadowgrass. Eventus is ranked #2 and #3 for fineness of leaf in Tables G4, and shows very fast recovery and growth rates (ranked #1 in the top 40, Table L1) for a summer sports ryegrass. This enables quick germination, establishment and mid-season repair in areas of high traffic. Barsignum is another outstanding ryegrass in its own right, ranked #5 in Table L1 and #4 in G4.